Fastest, strongest and widest network. You’ve probably heard the same marketing slogans from telcos but which is truly the most reliable in Malaysia? To ensure that our telcos are up to mark, MCMC had conducted an extensive network performance exercise throughout 2016. 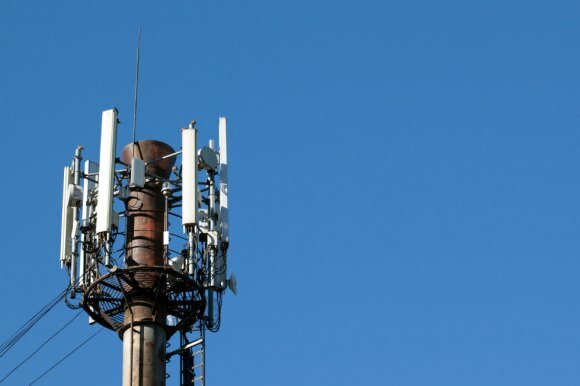 Read on to find out which telco is the best for data and voice call quality. As a base measurement, MCMC requires at least 650kbps download for sufficient video streaming with latency of not more than 250 ms. The 4G LTE players (Celcom, Digi, Maxis, U Mobile) were tested using Cat 4 LTE smartphones while WiMAX (Yes/Packet One) were tested using a modem. Among the six wireless players, Maxis is the fastest with an average download speed of 22.89Mbps and consistently delivering at least 650kbps speeds 99.76% of the time. 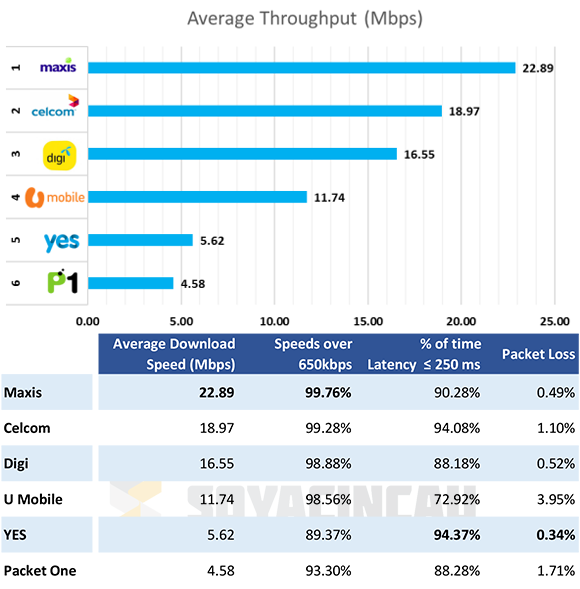 In terms of latency, Yes and Celcom are on top with not more than 250ms for 94% of the time. While Maxis is the fastest nationwide, it is worth pointing out that Celcom is faster in the Klang Valley, doing 24Mbps versus Maxis at 21Mbps. Among the LTE Players, U Mobile has a lot to improve as it recorded just 11.74Mbps for average downloads with a low 72.95% for its 250ms latency benchmark. Packet loss is also the highest for the orange telco at 3.95%. Do note that these tests were conducted outdoors on street level and obviously most people spend more time indoors. How well it performs inside a building would depend on in-building coverage and how well its signal could penetrate walls. Apart from mobile data, MCMC has also conducted extensive tests for voice calls. They have evaluated each telco for drop calls (DCR) and call setup successful rates (CSSR). These are determined by how well it can hold a 120-second call and if it can connect within 20 seconds from pressing the call button. For its first test routes covering 3,736km around the Klang Valley, Maxis has the least number of drop calls at 0.68% and it also has the highest call setup success rate (CSSR) at 99.53%. In the nationwide tests covering 6 regions, Celcom has the least drop calls with 0.83% DCR while Digi has the highest call success rate (CSSR) at 99.28%. All four telcos have passed their mandatory standard requirement of having DCR (Dropped Call Rate) below 2% and CSSR (Call Setup Successful Rate) above 95% in 2016. Despite the arrival of fibre broadband, there’s still a lot of users relying on ADSL connectivity. To gauge broadband performance, MCMC reckons that ADSL subscribers should get 70% of their promised speeds and 90% for fibre broadband services. From their tests, Maxis appears to be the best in meeting those speeds with the least packet loss. TIME broadband which offers faster speeds up to 500Mbps is shown to have the best in latency by recording 85ms or less 100% of the time. When measured against the mandatory standards of Quality of Service, Maxis has the highest compliance for Fibre at 91.5%, followed by TIME at 71.4%. 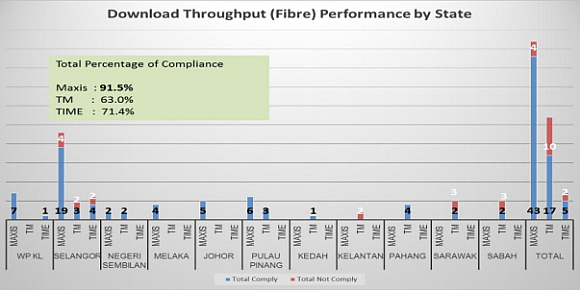 TM, which has the largest fibre subscription lags behind at 63.0% compliance. It gets worse for TM when it comes to ADSL. Except for Kuala Lumpur and Johor, TM ADSL (Streamyx) subscribers are having poor connectivity with just 46.1% compliance. The obvious solution is to switch to fibre broadband but its service availability is still very limited. Interestingly, Maxis is doing much better at 84.6% compliance.